The Life of Bon: Christmas shopping: Survival of the fittest! This week I set out with mi madre to do a bit of Christmas shopping. First and foremost, I dragged my mom into Forever 21 and begged her for two new pairs of skinny jeans. She didn't put up much of fight. There was a day when my mom vehemently opposed skinny jeans, but I guess somewhere along the way she realized there are worse things in life than a 27 year old daughter who wears skinny jeans on the weekend. My best friend, CrazyA, accompanied us on our shopping excursion. Her main job was to entertain my mom while I was in the dressing room. She did so by shocking my mom with every outlandish and inappropriate thing that could possibly escape from her mouth. To top it all off, CrazyA weaseled her way under the dressing room door to watch me change while I yelled "get out of here you perv!" and my mom giggled from the other side of the door. The sales associate no doubt was trying to stop the whole thing, but what can you do when you turn around and a grown woman is crawling under the door trying to harass her friend? Absolutely nothing. I'm in love. It's practically all I've been able to think about since we bought them. 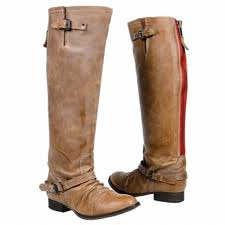 I'm so obsessed that I think Hubs might be worrying that I am going to run away with these boots. It's a valid concern. Moving on... Next was Hubs shopping day. Hubs is getting a suit for Christmas. I discovered during our shopping excursions this weekend that Hubs is much less picky than I am. He liked all the suits. Pinstripes, black, gray, he was just tickled pink with every suit we showed him. He picked a suit easily, found the right size, and was on his merry way in a matter of minutes. That's why I married him, folks. WHY I MARRIED HIM. While my mom talked to a friend in the store, Hubs and I went to check out the pet department. Yes, the pet department. You see, there are quite a few dog lovers on Hubs side of the family, so we thought this department might lend itself to some easy Christmas shopping for us. We looked at all sorts of pet paraphernalia: bones, clothes, toys, beds, etc. And so the pet furniture was left at the store. How about attaching another (old) non-dry-clean-only tag to a dress while you're in a changing room? Haha! Just kidding! I couldn't imagine not buying something I loved just because of the care tag! You should check out Dryel - http://www.dryel.com/ - I never take anything to the dry cleaners anymore, and just do it all at home. So my suggestion is to go back and buy the Audrey dress and pick up some Dryel on your way home! Curse those tags! I have a handful of things that probably don't say dry clean only on them, but they were too expensive to not dry clean, so I do. I just go once a month or so and take a handful of items, a blazer, two pairs of pants, maybe a dress and it costs $20 tops. It's totally worth it. Plus, did you know that many dry cleaners will take ALL of your clothes and wash and dry them and FOLD THEM for you for like $1.50 a pound? So tempting... too bad we'd still have to put them in drawers and hang them up. Good luck with the rest of your presents! Dem mamas - they just function so much better than the rest of us, don't they? I recently bought a sweater for 9.99 and discovered when I got it home that it is dry clean only-I guess because of the leather elbow patches. I washed it on cold, delicate cycle and hung to dey and it is fine. This cracks me up, your writing is so funny. Love this post! so great! and glad that you found what you were looking for!